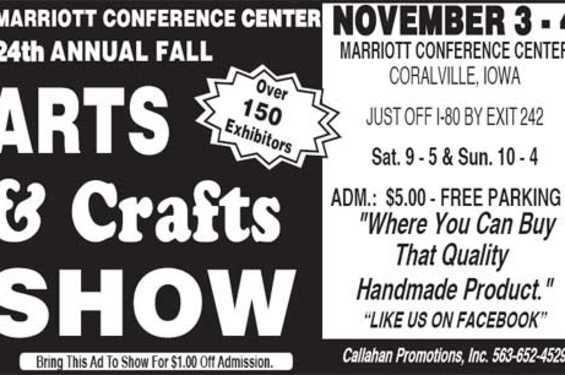 Make plans now to attend the Annual Fall Arts & Crafts Show on Saturday and Sunday, November 3-4 at the Marriott Conference Center in Coralville, Iowa. 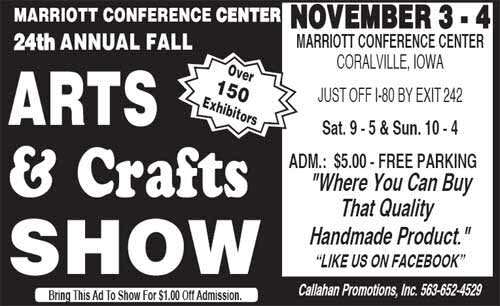 This is the area's largest show, with over 150 talented exhibitors presenting and selling the Midwest's finest handcrafts. The show is a production of Callahan Promotions, Inc. and offers patrons the opportunity to enjoy original affordable arts and crafts. Among the various products presented at the show are oak furniture, paintings and prints, gourd art, bird houses, bird feeders, ceramics, jewelry, metal art sculptures, pet products, yard and garden art, stained, etched and fused glass, quilts, photography, pottery, candles, clothing, floral wreaths, dolls and doll clothing, rugs, baskets, aprons, placemats, table runners, purses, wood and metal signs, wall hangings, and many more original products. Exhibitors will also be selling homemade salsa, wines, fudge, coffee cakes, barbeque sauce, jams, dried soup and food mixes.